HubSpot’s been on a roll lately. They significantly upped their investment in product development and at INBOUND ‘18, they released a bunch of new tools to help you close more deals faster -- and they are slick. 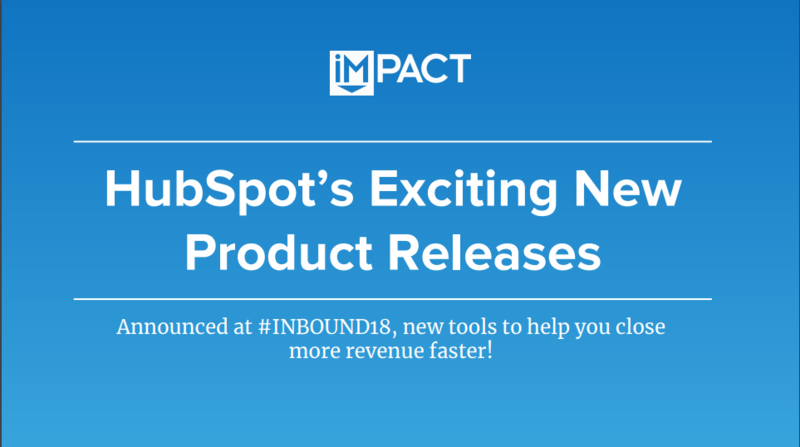 We’re already taking advantage of these tools at IMPACT, and all of our clients and HubSpot users should be taking advantage of them, too. That’s why we recorded this exclusive video conversation with Lou Orfanos, HubSpot's VP and General Manager of the Sales Hub, and my good friend, Rick Whittington, who has helped dozens of companies get up and running with the HubSpot CRM quickly. Can you see how these tools would be useful in your organization? Want to learn more about what it would be like get up and going with these tools? Set up a time with us using the calendar below to get started.